A late French Epiphany cake - a French girl "cuisine"
Hello everyone! So many time that I have not written anything. I am really sorry about that I think I will be sorry for a long time. I was busy planning my wedding and now I am moving as well. Between you and me, I have some troubles to manage everything. That’s why I was letting you down. So I baked this beautiful French epiphany cake in January and unfortunately didn’t manage to post it yet. But I love that cake so much than usually I bake it all year-round. Keep the butter out of your fridge 30 minutes before starting. Mix butter with almond powder, sugar and one of the eggs. 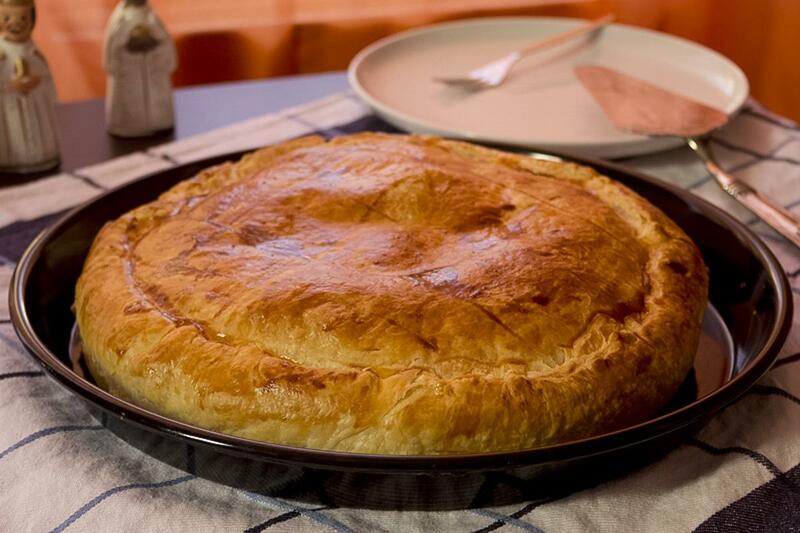 Place one puff pastry in your pie plate. Riddle with holes. Spread almond mix on top of the pastry. Put charm and cover with the second pastry. Remove the surplus of pastry and close pie. Make lines using a knife (see picture) on top of the pastry. Mix one egg yolk with 1 tablespoon of water and spread on top of the pie. Cover during the last 10 minutes if becoming too brown. To make it more fun, buy a crown as well. Usually one of your guests, most of the time a child, but if a friend of yours want to do it that’s definitely not forbidden, goes under the table. You cut the Epiphany cake and you say “who wants this one?” moving your finger 4 times across the different slices of pie. You stop and the person under the table should say a name of one of your guest. You repeat the game until everybody has been served! Don’t feel bad! Nearly everyone needs to take a break from blogging sometimes, when life gets busy. Enjoy planning your wedding! Is the wedding date soon? No, actually it is in september… that’s why I am already feeling guilty for the next late posts…. :)! Good luck with your wedding! The cake looks delicious! I will need some! Thank you! The cake looks so good! And no wonder you have been busy! I just moved house and just the organization of it! 🙂 I hope it all went well! Thank you really much! Yes, it went really well.